Analysis of the theories and experiments done so far on sound-producing (e.g., roaring, booming) sand avalanches. Vol. 277, No. 3, p. 84 (September 1997). Translated into several languages (e.g., Arabic, Chinese, French, German, Japanese, Polish, Spanish). Vol. 38, No. 5, 329-342 (October 1997). Postscript preprint (equations are fully legible, but you need to use a PS-viewer or printer). PDF version (best choice, with color photos). HTML version (Recommended version if you do not have a Postcript viewer/printer. A few equations are a bit hard to read in the HTML version). Fig. 1 Color photo of a booming sand dune (Sand Mountain, NV). Fig. 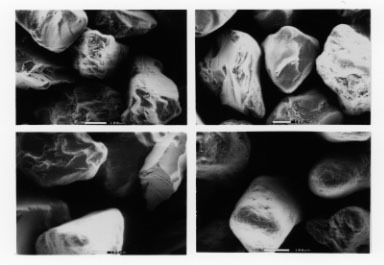 2 Sand grain micrographs (see text). Fig. 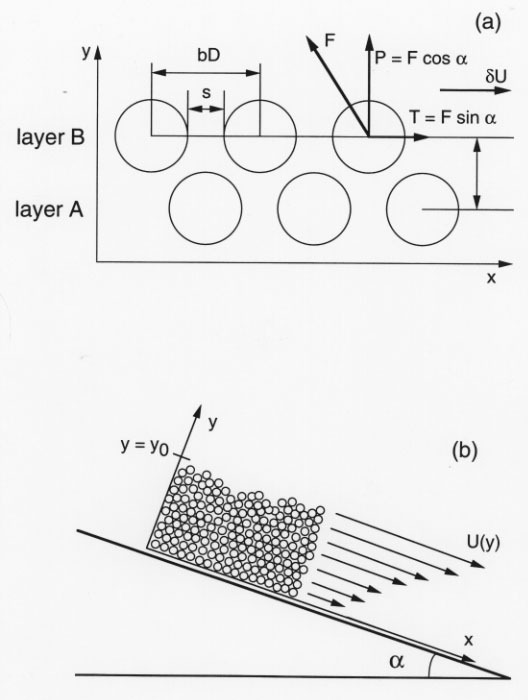 3 Schematic diagram of shearing in granular assemblies. Newspapers in the US (e.g., Dallas Morning News, Oct. 20, 1997, Discovery Section, large cover story; Interviewed in Science on-line: ScienceNow (6 March 97). Also, in newspapers in Colorado and Michigan.). Newspapers abroad (e.g., Swiss Die Weltwoche , Oct. 2, 1997, Science and Culture Section, full page article; and also in Germany, Deutsche Presse-Agentur, August 19, 1998). Science Magazines abroad (e.g., Italian Focus, Dec. 97, devotes five pages (p. 32-36), including an interview and part of the cover; Also, Panorama, page 165, May 14, 1994). American Institute of Physics: Science Report Radio (Physics News broadcasted by Radio Stations) (1998). Preliminary results of this work were featured in Science 264, 200 (April 8, 1994). An interview will appear in a TV program for The Discovery Channel. Sound recordings of compressed squeaking sands and avalanching booming sands. The sizes of the sound files are small. 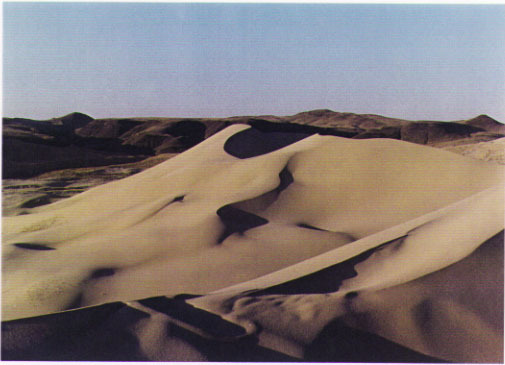 These recordings, and the croaking-sand sound below, are kindly provided by Professor Shigeo Miwa (in Kyoto, Japan), who has studied sound-producing sands . Sound recording of croaking sand Beach sand that emits a "croaking" sound when sheared in water. 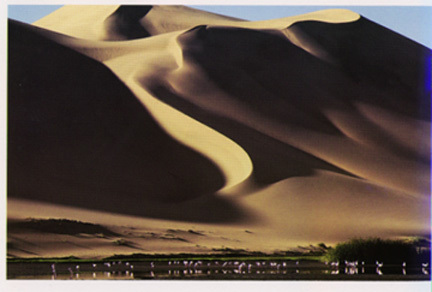 Booming Dunes, Namib Desert Sandwich Beach Harbor and Flamingos. 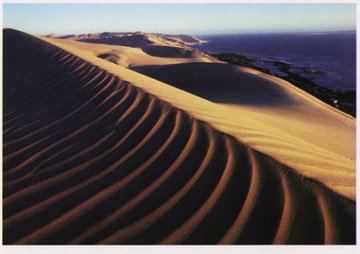 Booming Dunes, Namib Desert Booming Sands (these two Namib desert photos are by Annie Griffiths Belt).